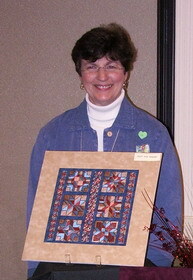 I am a former school teacher who started teaching needlework classes at a local department store. In 1975, I opened my own cross stitch and needlework shop, "The Needle And I" and then began my own designing in 1995, with the creation of my design company, "From Nancy's Needle" . Fortunately customers began asking for more of my work! I was happy to oblige and thus began my journey into professional design work. My designs were then distributed to other needlework shops. They were also well received at the needlework retail trade shows in Nashville and St. Charles. After 37 years, the time came for me to retire from having a brick and mortar store to spend more time with my family. I also needed to concentrate on creating, publishing and marketing the designs "From Nancy's Needle" . If your local needlework shop doesn't offer my designs you can order them directly from my on-line store, or have them contact me.